Kevin Nisbet says he won’t let himself get too carried away after being rewarded for a stunning start to the season with a contract extension at Raith Rovers. 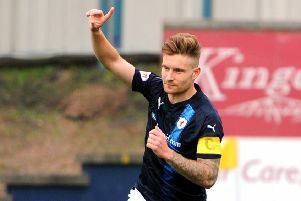 The man with the most league goals in Scotland has committed to the club until May 2020 after scoring an impressive 18 times in 21 appearances since joining from Partick Thistle in the summer. The 21-year-old has found his groove in Kirkcaldy after struggling to make the breakthrough at Firhill, and failing to set the heather alight during loan moves at Ayr United and Dumbarton. And Nisbet reckons that his difficult past experiences will ensure he remains on the right track at Stark’s Park. “I had to prove myself when I came here,” he said. “Now it’s just a case of kicking on and not getting too above my station. I’ve been there before when I was with Partick Thistle. “I thought I was too good, and that my ability would take me through. Obviously it didn’t and I’ve learned those lessons very early in my career. “I went on loan to a few clubs I probably shouldn’t have at that time. They were part-time and I needed to go to a full time team. “I was getting big headed because my name was going about, and everyone started to hear about me scoring goals in the U20s. “But when it came to the first team reality hit – it was much, much faster. It’s been a blessing in disguise because I’m here now, I’ve learned from my mistakes in the past, and hopefully I won’t make them again. Nisbet initially signed for Barry Smith, but following his resignation in September, the striker has simply continued scoring goals under new gaffer John McGlynn. “I’m loving my time here just now,” he said. “I signed for Barry and he made we feel wanted, but I feel even more wanted now and that the gaffer has a lot of trust in me. “I’m probably enjoying it more now because the way the gaffer has got us playing is brilliant and suits me perfectly. “It’s how detailed he is in everything. He covers every scenario that can happen on the pitch and I’ve been very impressed with that. “I have great team mates too that have set me up for the goals to get me to this stage.